Genergy, LLC has teamed with BBA (aka Barra Blue Associates) to build a 12-Floor High Rise Vertical Fish Farm. BBA has won many awards internationally and in their home country Australia. The “EPA Water wise Achievement 2004” is particularly important as we seek to limit the amount of water in and out of the facility. The Fish Species Selection BBA recommends is supported by their numerous project success stories in different countries around the world. In addition to the expertise in profitable healthy environmentally friendly fish farming BBA is led by a seasoned architect Geoff Orpin. Mr. Orpin will work closely with local architects and construction companies to develop the project quickly, safely, and with the lowest possible cost.The USA is growing in both the quantity of fish being farmed using Recirculating Aquaculture Systems (“RAS”) and in the type of (species) fish they harvest. Barramundi is one of the species that Barrablue has experience with. In Massachusetts, another company, Australis has done a fantastic work promoting Barramundi. Their marketing and sales has improved the US appetite for Asian Sea Bass as evidenced by the robust sales at www.thebetterfish.com. 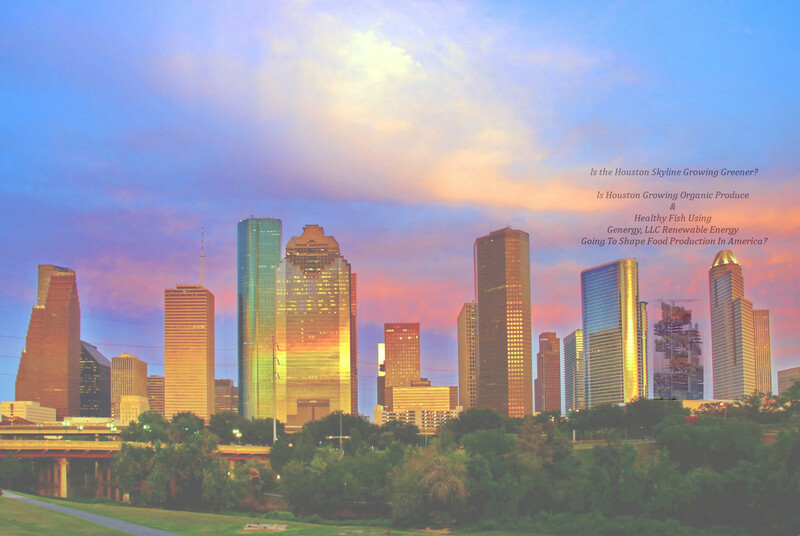 Houston, TX is growing at a very high rate. People in Houston are also growing in their appreciation for different types of seafood, protein, and organic healthy fruits and vegetables. The assortment of “Farm To Table” fish and produce fits nicely into Houston’s push to stay “Lean AND Nice” (apart from their NFL Team). The Houston Aquaculture Team is conducting market research in conjunction with local agencies, potential commercial customers, and fishery experts to determine the mix between Kale, Lettuce, Peppers, Kohlrabi, Sage, Thyme, Rosemary, Basil, and other fruits and vegetables as well as the percentage of Striped Sea Bass, Barramundi Asian Sea Bass, Tilapia, Trout, and Salmon Houstonians will prefer to purchase. What is certain to all is that the “Whole World Is Watching To See When Genergy, LLC Renewable Energy Will Change Agriculture To Provide More Fresh Healthy Food”. 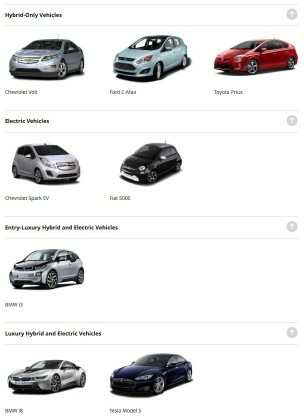 Have you noticed the rise of Hybrid and Electric automobiles? Have you asked yourself; “Where do they get the electricity?” An electric car runs on batteries charged with electricity. A hybrid car runs on gasoline and batteries charged with electricity. A hybrid has the advantage of being able to use the gasoline powered engine to move if the batteries run out of charge. Both Hybrid and Electric Vehicles use “Regenerative Breaking” so that when you slow down or brake the motor RE-charges the battery by running backwards. The motor transforms into a generator to fill the battery back up. But, both vehicles also have Charge Sockets where the operators “Plug In” to recharge the batteries. Operators use electricity that is generated by some other fuel such as Coal, Natural Gas, Nuclear, and even Wind or Solar power plants. Wouldn’t it be nice to know that the Electric Car or Hybrid Vehicle that you are driving is charged with God’s Energy without ANY fossil fuels being used and without any emissions into the atmosphere? Thanks to the USEPA “Green Power Equivalency Calculator Methodologies” website page you have access to information. Does that sound like a fair trade? Nancy Pearlman has been a Leader and Champion of Ecology and The Environment for decades. Ms. Pearlman has hosted a radio show called, “Environmental Directions Radio Series“ that is a nationally syndicated program environmental enthusiasts over 20-years. Kurt Grossman was interviewed by Nancy Pearlman to present the case for “Underwater Hydroelectric Power Generation” to people who care about wildlife, oppose pollution, and who enjoy nature on a regular basis. You can listen to the interview online. 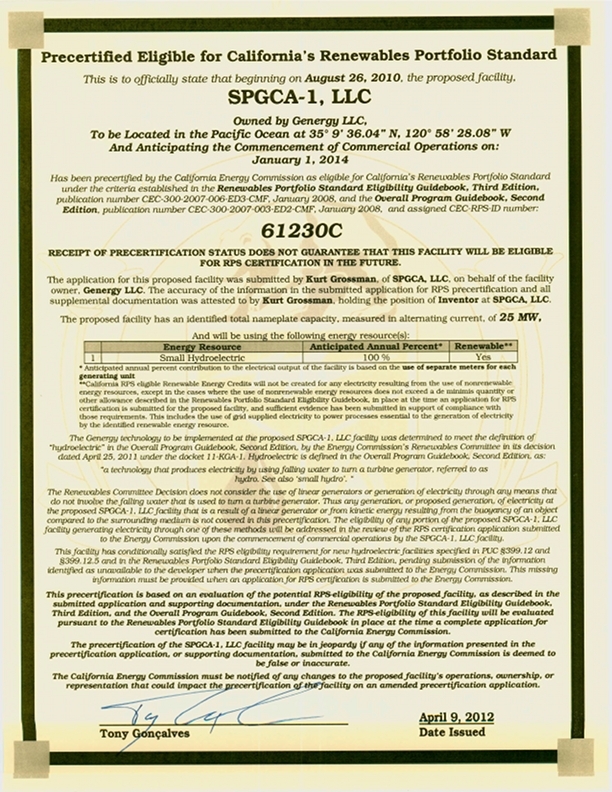 Genergy, LLC uses the acronym “AIRPAC”. The “C” in AIRPAC stands for “Clean”. A nonprofit organization named “The Surfrider Foundation” has a passion for Clean Oceans. Several years ago Dr. Chad Nelsen interviewed Kurt Grossman to find out why Mr. Grossman had a passion to see Genergy, LLC technology installed in oceans to generate electricity. 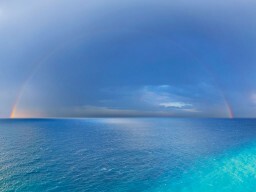 Genergy, LLC is committed to delivering renewable energy that not only protects our oceans but eliminates air pollution. Genergy, LLC technology developed technology that relies on Classical Physics. Sir Isaac Newton wrote the Laws of Conservation of Energy over 400-years ago and these Laws provide Genergy, LLC with a way of calculating how much Potential Energy actually might become Kinetic Energy that we can use beneficially. The Wolfram “Mathematica” software program is able to model complex algebraic calculations visually in an incredibly powerful way so that ordinary people like you and me can look at an animation moving based on over 40 different Calculus & Trigonometry formulas according to the Laws of Thermodynamics. One mathematician said it “Looks like magic…” when we gave him the model to critique. 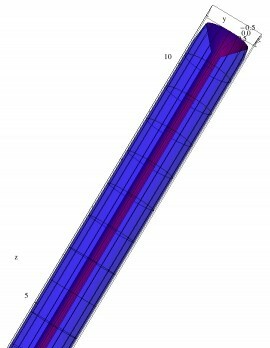 In 2011, our Naval Architect and Marine Engineer delivered mathematical formulas to Wolfram Consulting (the division of Wolfram, Inc. that provides expert consultants on a fee basis) to create a Mathematica 3D model and simulation. After the Mathematica model performed well we hired a local university to validate their work and format the model and simulation for academic institutions. A team of physicists, mathematicians, and software experts (especially capable with Mathematica) validated the model. Over a period of 2-years the team carefully investigated the mathematical formulas for errors; diagnosed and corrected the formatting of the model; asked probing questions about the purpose of the variables; and questioned the purpose of the model. After the 2-years of collaborative applied research where the university researchers questioned, analyzed, and ultimately reformatted the model so that it could withstand the rigors of “Peer Review”. The researchers once again validated the mathematical model and used our company as a Case Study in another research grant with the United States Department of Energy. Genergy, LLC has used Mathematica to internally validate the physics and mathematics of our technology successfully. We have delivered our model and simulation for academic validation successfully. We intend to make Mathematica and other 3D Modeling & Simulation a standard practice for all future products and technologies we consider because we believe it is the Best Practice for the 21st Century. Genergy, LLC applied for “Pre-Certification” under the California Energy Commission (“CEC”), Renewable Program Standards (“RPS”). The “Small Hydropower” classification is for hydroelectric dams that are 30 Megawatts or less power. At first, the CEC was startled by the idea that a “dam” could be located offshore and confused how Genergy, LLC made electricity with “hydropower”. After the initial application and appeal were denied the final process was a hearing in Sacramento, CA in front of 2 Commissioners on the California Energy Commission. The CEC Staff and Attorneys and Genergy, LLC and a professional Hydroelectric Engineer offered up testimony to the Commissioners. The Decision made by the Commissioners not only approved the Pre-Certification for the SPGCA-1, LLC but also states that future power plants will also qualify. CEC, RPS Pre-Certification is a tremendous benefit for renewable energy! Patent 8,981,582 (God’s Energy) means an unlimited supply of clean renewable energy that is cost effective will begin to be manufactured and submerged offshore invisible to the human eye. Gigawatts of power will be delivered to cities along the coast of all the continents and to islands around the world. Air pollution created by large power plants will disappear. Power to desalinate offshore underwater without harming ecosystems or spewing CO2; without sucking in fish and plankton and without discharging brine; is here. The process of obtaining a Patent in the United States of America is a very long journey. The Founding Fathers recognized that invention rights are important to stimulate creativity and protect inventors who come up with new ideas from wealthy and powerful interests who would either want to steal the invention or make sure it never became a product. The Journey for US Patent 8,981,582 began in July 2009 with a Provisional US Patent. This simple Patent is very inexpensive to apply for and does not have the more rigorous requirements of a Full US Patent. The application simply stated the “Immersed Hydropower System” would work like a Dam (similar to Hoover, 3 Gorges, or Itaipu) without stopping a stream or river because it would be placed underwater in a lake or ocean. The Full US Patent 8,981,582 is much more complex and was examined by USPTO Examiners. The Examination Process includes searching the global databases of patents including the USPTO Database to see if there are other similar types of inventions and to see if any of the Claims in the patent infringe (are the same as so that they may not be considered new or the property of the inventor applying for the new patent) on any other patents. The “Non obvious” element was overcome after years when the “Mathematica” model and simulation were validated independently. Gravity & Buoyancy are the ultimate in “Obvious”! Combining gravity & buoyancy has been attempted many times and many failures have been used to commit fraud. The “Useful” element was the MOST difficult to prove to the Examiners at the USPTO! A Patent will not be granted to an invention considered “NON Useful”. 1 type of device specifically restricted is a Perpetual Motion Machine. The “Submerged Power Generator” (SPG) appears to use only 1 source of energy and the “SPG” appears to violate the Laws of both “Conservation of Momentum” (Isaac Newton) and “Thermodynamics” (Carnot). It took several years of submitting detailed expert testimony and mathematical validation in order to explain how the SPG invention works in accordance with the Laws of Physics to generate electricity very much like other hydroelectric dams. In the end, March 17, 2015 the United States Patent and Trade Office granted US Patent 8,981,582 and the invention is protected. Patent 8,981,582 means Blessing to the World.